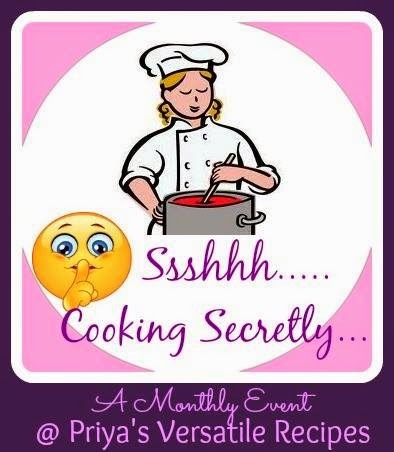 I am very excited and happy to be part of "Shhhhhh Cooking Secretly Challenge" hosted by Priya Suresh from "Priyas's Versatile Recipes". Every month, we are paired with a different blogger and 2 Ingredients were shared secretly between them. And the final recipes are revealed on 16 th - 18th of every month. Very Interesting friendly challenge and also it helps us to get to know about other bloggers. Thanks Priya akka for hosting such as an Interesting Challenge and extremely sorry for posting my recipe little late. For my first challenge, I was paired with one of my favorite blogger and lovely friend Shama Nagarajan from Easy2cookrecipes.blogspot.in. Very Energetic Blogger, sometimes I wonder how she manages to do blogging with two kids and that shows her passion too. Her blog has more than 600 yummy and delicious recipes, click HERE to view her mouthwatering recipes. The two secret Ingredient, which I got from shama was Cucumber and Dates. Prepared this very simple and easy recipe and served chill with Grilled lemony chicken. This can be prepared in very short time but taste very yummy and can also be served with bread as cold Sandwich. Take a bowl and add chopped onion followed by Tomatoes, Cucumber and Dates. Remove, add crushed pepper and mix well. Serve with Grilled Chicken or cold sandwich. Cold Sandwich : Take 2 slices of Bread, fill it with chilled salsa and serve. Very interesting and quite a unique salsa, beautiful dish Priya.